Let’s imagine a scenario where there are 150 possible conservation programs that can be implemented by a conservation agency. Each has a fixed cost randomly selected from a normal distribution (mean = $ 5 000; standard deviation = $ 1 500) and a fixed conservation benefit, also from a normal distribution (mean = 70; standard deviation = 15). The benefits are arbitrary units but, if it makes things easier to understand, imagine that it is the number of species protected by the program. 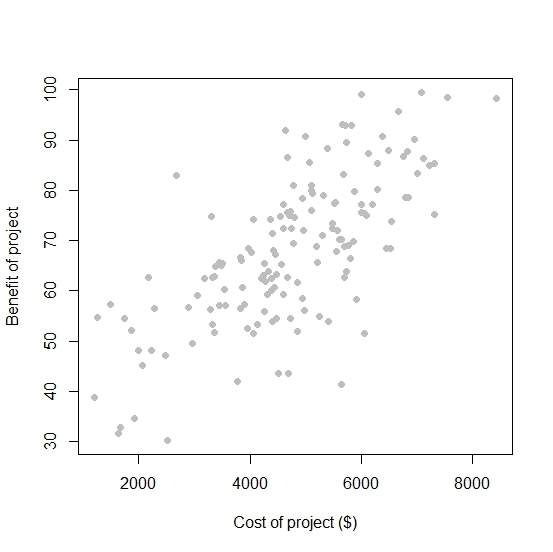 The scenario is also set up so that there is a 0.75 correlation between the cost of a program and its benefits: generally, the most expensive programs reap the greatest conservation rewards (although this relationship is not perfect). It is also worth mentioning that, while these parameters were selected at random, all conclusions are robust irrespective of the choice of parameters. Now, let’s assume that there are four deputy-directors that can devise a conservation portfolio by investing in the 150 different programs while being limited by a strict budget of $ 200 000. Looking at these results, who would you promote to be the next director of the conservation agency? Remember that they all spent the same amount of money: $ 200 000. 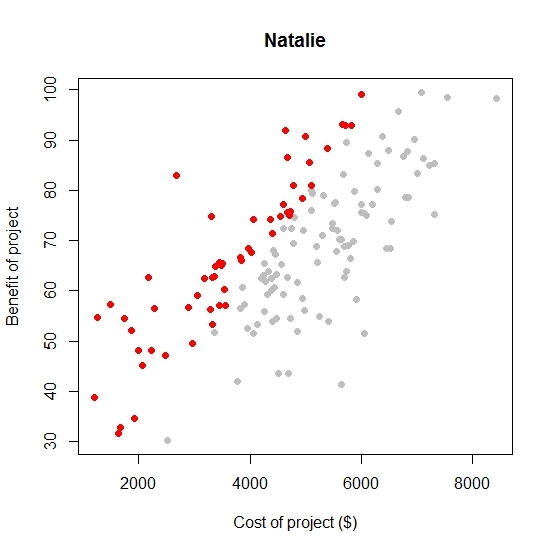 Natalie, with her Type A personality, outperformed everyone… In fact, it wasn’t even close. Dreary, number-crunching Nigel got himself second place by always choosing the cheapest option. 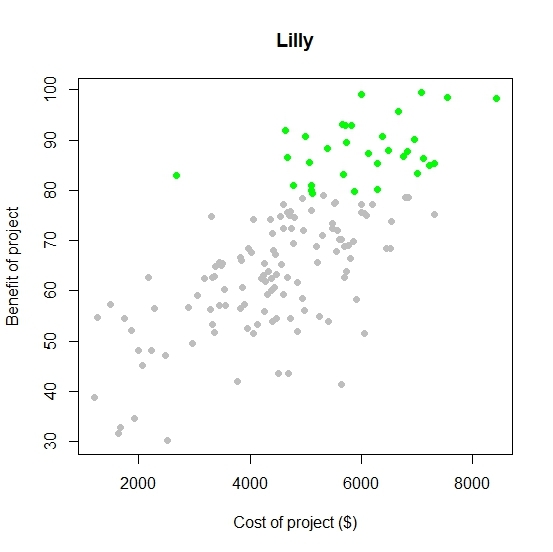 Lilly, the only ecologist and arguably the only deputy-director with sincere motives driven by environmental consciousness, came dead last! 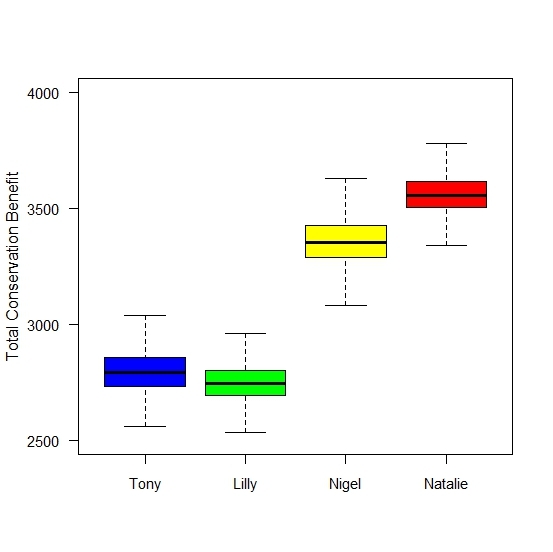 Even Tony, who might just as well have rolled dice to make his decisions, beat her. Who would you promote to the position of director? 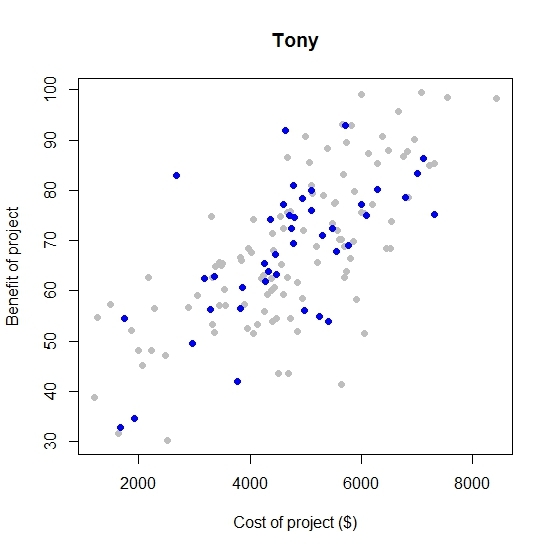 You could replace Tony with a random number generator (or an intern who can flip a coin). Surely he isn’t the best candidate? Lilly’s intentions were pure and she really cares about nature but, let’s face it, her passion blinded her to the financial realities of the modern day conservation world. She’s rather bad at her job. 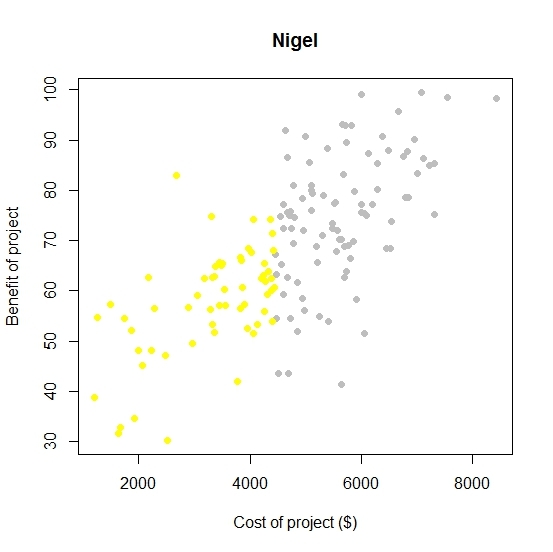 Nigel, while actually quite effective, knows absolutely nothing about biodiversity. In fact, his ignorance is only exceeded by his disinterest. Is he the person you want to represent a conservation agency? Lastly, there is Natalie. She clearly outperformed all the others. She is undoubtedly a super-star when it comes to her job. While I wouldn’t go as far as saying that – as was the case with Lilly – passion always undermines the efficacy of conservation efforts, it’s clear that passion alone is not enough to reverse species loss. This is especially true in the real world, which has more economic, social and political intricacies conveniently omitted from my toy model. Conservation is a complex task and it needs people who can appreciate complexity and tolerate ambiguity. It needs strong-willed people who can see the bigger picture and make difficult decisions that, at the surface, seem to go against the grain of traditional environmental ethics. This entry was posted in Conservation careers, Eco-philosophy, Environmental politics, People and conservation and tagged Biodiversity, Careers, Conservation, Ecology, Nature, Passion. Bookmark the permalink. ← Nah, mate, they just toss ’em into dog food! This is a really brutally true post – we might have passion, but we need to combine our passion with practicality and pure cold-blooded economics, because (sometimes) it can be better in the long run for conservation, even if we don’t believe it to at the time. Thanks for the comment, Rachel. A study by Richard Fuller and his team showed that, by replacing the least cost effective 1% of protected areas with the most cost effective land not currently under protection, they could increase the area under formal protection in Australia by 5 million km2… for the same cost. It’s astounding. What the numbers didn’t reflect, however, is how the most expensive sites often have critically endangered species. So, conservationists might have to accept that effective conservation could possibly send species down a path to certain extinction if their protection is not cost effective. That’ll be a bitter pill to swallow. It will always be a tricky balance between what is fair and what is effective. I’ll have a peek, thanks. I think a balance has to me met between the cost of the conservation of a species and the long term benefits and likelihood of success – for example, I think it is a waste of time and money and effort to conserve the panda. Yes it would be a shame to loose them, they are lovely, and they are such a flagship species, but even if the captive breeding programmes were a success, they will never thrive, or perhaps even survive, in the wild, because there simply isn’t the habitat to support them. So until work is done to improve/increase habitat for critically endangered species, the programmes will never succeed, which in my mind is a waste of resources that could be used to conserve less vulnerable species that have a greater chance of becoming common again, rather than remaining vulnerable because they are not seen to be as important perhaps. But then it could come down to morality and ethics…. are we attempting to conserve them to ease our conscience for making species critically endangered in the first place? Or are we genuinely conserving them because we believe it? Aren’t we playing god and interfering with the natural world even more by trying to re-introduce species? I don’t think we will ever know the answers!